Over the weekend we were strolling the boardwalk in Seaside Heights. Inside an arcade, I came across a wall of funhouse mirrors. Each one presented a comic, distorted me. I studied each reflection carefully and realized that this is exactly how I present myself to the world. A series of preposterous exaggerations. The people I work with have no idea who I really am and they never will. I won’t allow it. My daughters certainly haven’t a clue. How could they? They lack perspective. I don’t put my true self out here in blogland. Who does!? Don’t all posts contain a modicum of half-truths and boasts? I moved away from home decades ago so my siblings can’t know who I am anymore. My wife knows me better than anyone but there are still hidden crevices that remain unexplored. Can we ever know our true selves? The voice in our head only tells us what we want to hear. Perhaps we’re all just a composite of these others selves. Maybe there’s no real true center. 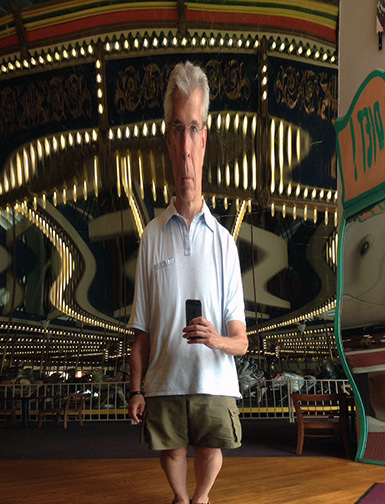 Just a series of funhouse mirror reflections. When I was a kid, we never had a nice car. My dad bought a series of junkers that were ‘great deals.’ They were broken-down wrecks on their last legs. Rolling scrap metal. Time bombs. One car had a rusted-out hole in the floor. You could see the road speeding by underneath. We used to fight over who got to sit over the hole and watch the road. We finally had to get rid of it because we were on a freeway and the carpet caught on fire. The car filled with smoke. Another time, my mom was driving the four of us kids to grandma’s house. While speeding down Fulton Street, the front axle snapped in half. We saw a tire rolling down the road and thought it was the funniest thing until we realized it came off of our car. We could have been killed. Over the weekend we bought a brand new car. It’s a mid-sized SUV with only 96 miles on the odometer. A big, suburban snooze-mobile. 12-year old daughter expressed mild disappointment that we didn’t get the limited edition with second row captain’s chairs and leather trim interior. Can you imagine? !